"This is archaeology on steroids"
In the south of England lies an ancient wonder that has never been explained: Stonehenge. Theories about the purpose of the prehistoric circle of stone columns range from ritual site to burial ground. And as if one mystery was not enough, researchers have just discovered something something even stranger- a bigger, older Super-Stonehenge buried nearby. “Everything written previously about the Stonehenge landscape and the ancient monuments within it will need to be rewritten,” said Paul Garwood, an archaeologist and lead historian on the project at the University of Birmingham. On Monday, a team from the University of Bradford announced the discovery of monument of 100 stones arranged in a circle. The site is spread over several acres. It is believed to have been built 4,500 years ago- the Stonehenge we are familiar with is only 3,500 years old. The Neolitic stones are arranged in a wide arc facing the river of Avon. The arena-like structure borders on the natural depression of a dry valley. While many of the stones have fallen to pieces, at least 30 remain intact. Each stands approximately 15 feet tall. The University had been working with the Stonehenge Hidden Landscapes Project to use ground-penetrating radar around Stonehenge to try and discover the meaning to the monument. What they found instead was an entirely new wonder merely 2 miles away, near the Durrington Walls. “These latest results have produced tantalizing evidence of what lies beneath the ancient earthworks at Durrington Walls. 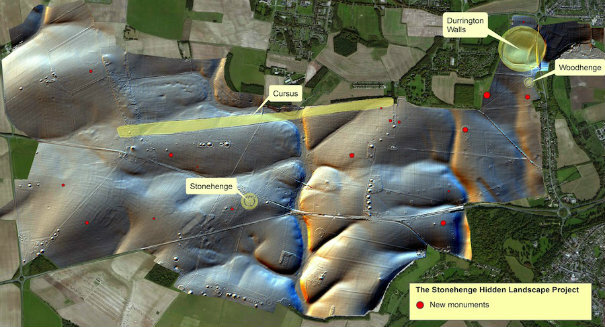 The presence of what appear to be stones, surrounding the site of one of the largest Neolithic settlements in Europe, adds a whole new chapter to the Stonehenge story,” said Nick Snashall, a National Trust archaeologist.